Captain Craig Bywater, Bmus (Hons) has been appointed as the Director of Music of our Corps Band. His first assignment was to the Band of the Royal Logistic Corps in Deepcut, Camberley. Following a selection cadre in 2005, he was chosen to commence the Bandmaster Course in 2006 at Kneller Hall, and as part of his course assessment he was required to write a march. His composition â€˜Lion, Sword and Crown’ was suggested by the Editor as being suitable for the Corps Slow March following its inaugural exposure at one of their evening concerts. It has been duly accepted and is now officially recorded in the Army List. Having graduated from the Royal Military School of Music in 2009 with a First Class Bachelor of Music (Honours) degree and having also been awarded a number of prizes, including, best conducting and band leadership, The Worshipful Company of Musicians’ Medal, and Best Overall Student Bandmaster, he was assigned as Bandmaster of The Band of the King’s Division. 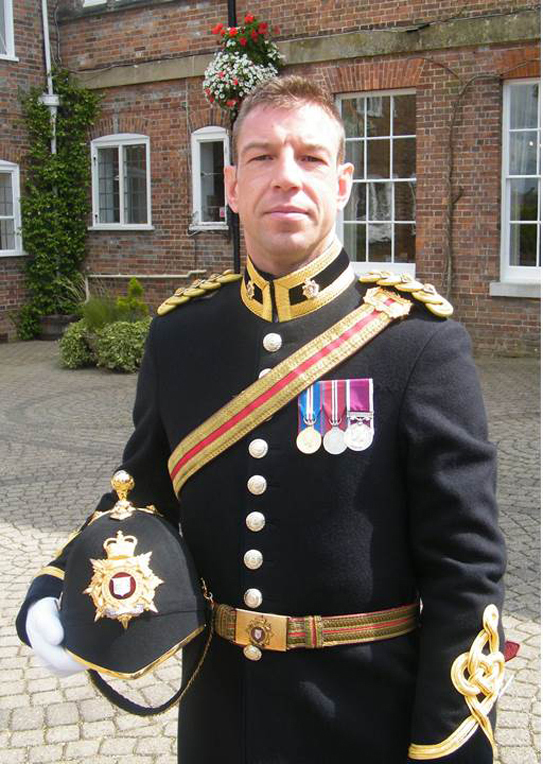 In September 2011 he was then assigned as Bandmaster of The Band of the Welsh Guards where he participated in many high profile State Ceremonial engagements. These included Her Majesty The Queen’s Birthday Parades, The Household Division Beating Retreat, The Diamond Jubilee celebrations and the 2012 Olympic Games. Particular highlights were conducting the band at various Olympic events and performing with the band at the closing ceremony of the Olympic Games. In July 2014, WO1 Bywater was commissioned and has returned to The Band of the Royal Logistic Corps as Director of Music. He is thrilled to return to the Band and Corps of Drums where his career first started and to take up his appointment.